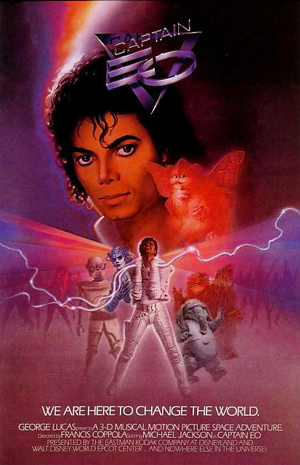 Child molestation accusations aside, I will always remember Michael Jackson as “Captain EO,” the star of a 3-D movie played at Disney theme parks between 1986 and 1994. I was bit too young to be a fan of Michael Jackson’s music at the height of his popularity in the 1980s, but the Captain EO movie at Disneyland made an impression on me as a child. The sci-fi movie, which required 3-D glasses to view, directed by Francis Ford Coppola and executive-produced by George Lucas. Anyone else out there have fond memories of watching Captain EO save the universe at Disneyland? This entry was posted in Pasadena and tagged michael jackson captain eo by Brian Day. Bookmark the permalink. open for 48 hours straight. Once you were in the park, you could stay. There were people sleeping on the benches, the train, etc.